The 1948 Genocide Convention clearly states that one instance of genocide is “the deliberate infliction of conditions of life calculated to bring about the physical destruction of a people in whole or in part.” No matter whether this happens at a fast rate, or in “slow motion.” That is what has been done to Gaza since the imposition of the blockade by Israel, and the subsequent massacres which led to the death of more than 4000 Palestinians in three successive genocidal wars. The same scenario was repeated in 2012, and a worse one in 2014 only because Israel feels that it can carry on its war crimes with full impunity. And last week Israel has decided to tighten the siege by closing the only commercial crossing, even to increase its attacks by targeting peaceful protesters demanding the implementation of UN resolutions, and an end to this deadly, hermetic siege. In her visit to Gaza, Professor Sara Roy, an expert on Gaza, describes the Strip as “a land ripped apart and scarred, the lives of its people blighted. Gaza is decaying under the weight of continued devastation, unable to function normally…” Professor Roy concludes that “[T]he decline and disablement of Gaza’s economy and society have been deliberate, the result of state policy–consciously planned, implemented and enforced… And just as Gaza’s demise has been consciously orchestrated, so have the obstacles preventing its recovery.” In addition to Israel’s daily attacks and air strikes, Gazans also suffer from the contamination of water, air and soil, since the sewage system is unable to function due to power cuts necessitated by lack of fuel to the main generators of the Gaza power grid. Medical conditions due to injuries from internationally prohibited butterfly bullets and other illegal Israeli weapons as well as from water contamination cannot be treated because of the siege. In addition to the ban on building materials, Israel also prevents many other necessities from being imported: lights bulbs, candles, matches, books, refrigerators, shoes, clothing, mattresses, sheets, blankets, tea, coffee, sausages, flour, cows, pasta, cigarettes, fuel, pencils, pens, paper… etc. 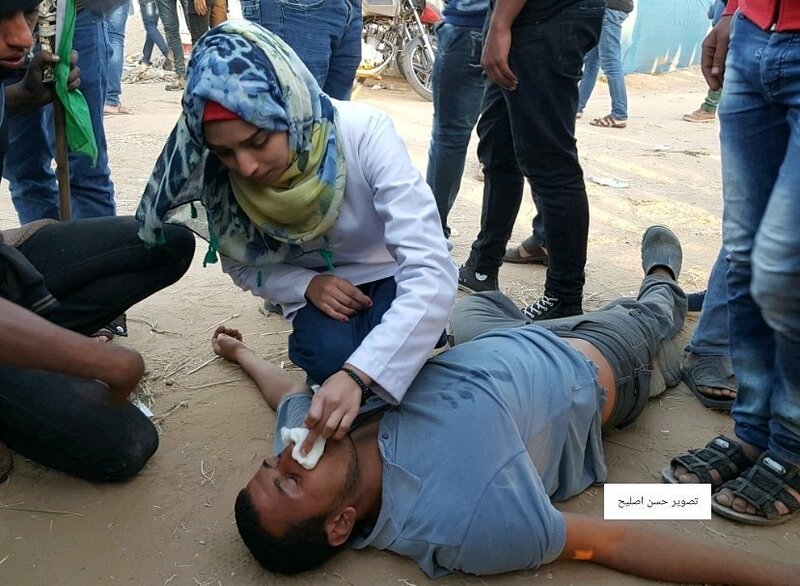 In Gaza, people are wondering whether the current Israeli government, the most fascist in the county’s history, might even discuss a ban on Oxygen! Add to this the punitive measure taken by the PA, and the drastic cuts endorsed by UNRWA, not to mention the constant closure of the Rafah crossing–the only exit Gaza has to the external world– leading to one of the highest unemployment rates and poverty on the face of earth. In fact, the conclusion Gazans have reached is that Israel is intent on destroying Gaza because world official bodies and leaders choose to say and do absolutely nothing. The brazen refusal of Israel to cooperate with the decision of the International Community to re-construct Gaza, for which several billions of dollars were pledged in Sharm El-Sheikh, should not be tolerated. Israel’s attacks have damaged or completely destroyed many public buildings and have according to the UN’s own Office for the Coordination of Humanitarian Affairs reports severely damaged or completely destroyed some thousands of family dwellings, schools, universities and factories. Many other Palestinians who have spent the past several winters and summers in tents and caravans have also been promised the means to rebuild homes and schools, though to date nothing has been done to alleviate their suffering. In spite of Israel’s alleged unilateral withdrawal from the Strip in 2005, it still maintains a permanent military presence in Gaza’s territorial waters and controls the movement of people and goods onto the strip by land and water in addition to movement within the strip through targeting anyone entering the “no go” zone designated by the Israeli military. Israel also continues to control Gaza’s population registry. Yet, Israel claims that it is no longer the occupying power in the Gaza strip and uses this excuse, in addition to the results of 2006 democratic elections, to intensify its policy of siege and lethal attacks on Gaza’s civilians. And now, Israel has decided to become openly an apartheid state by legalizing racial discrimination. I have tried very hard to find out whether there are constitutions or laws in the world similar to Israel’s “new” Nation-State Basic Law which aims to establish a legal basis for Jewish supremacy and racism against indigenous Palestinians, including those living in what has become the largest open-air prison on earth; only South Africa under apartheid and America in the eras of slavery and segregation. In a piece published in MEE, Gideon Levy asks “Israel, where is your outrage at the legislation of Apartheid?” Actually, we are not expecting a settler-colonial community to act against its own racism. The outside world has to intervene. Hence our call for #BDS. But, in Palestine, we are in urgent need of serious discussions about a program of radical political transformation, what with the disastrous failure of the existing programs, right and left, a program that divorces itself from the racist two-state solution, one that endorses a more inclusive program that guarantees the rights of all segments of the Palestinian people.